Major retailers are gearing up for the upcoming holiday shopping season, which officially kicks off on the post-Thanksgiving shopping day of Black Friday. 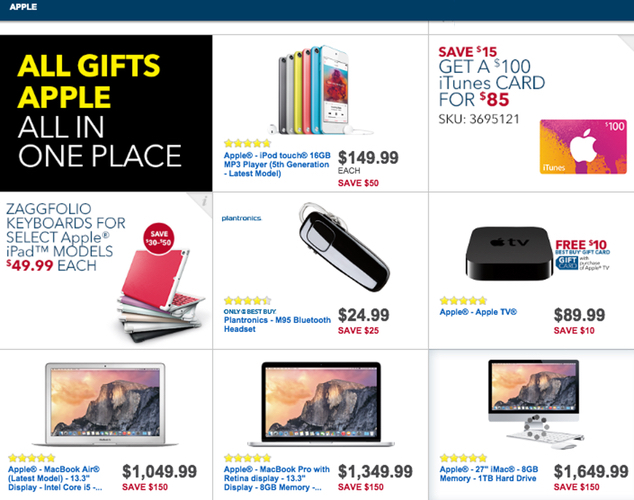 Following leaked Black Friday sales flyers from both Sam's Club and Target, Best Buy today published its door buster deals ahead of the November 28 shopping holiday. Similar to Target, Best Buy is discounting all iPad Air 2 models, with prices starting at $399 for the 16GB WiFi-only version. While Target is offering a $140 gift card, Best Buy is offering a more straightforward but smaller $100 discount off the purchase price of the device. Best Buy also is slashing the price of the iPad mini 3 by $75, lowering the cost of Apple's latest tablet to $324.99 for the base 16GB WiFi model. Customers looking for Mac hardware can save up to $200 on select MacBook Pro, Retina MacBook Pro, MacBook Air and non-retina iMac models. Other sale items include the 16GB iPhone 6, which is being sold for $100 with a new two-year customer agreement, the 5th generation iPod touch 16GB ($149), the Apple TV ($89), a $100 iTunes gift card ($85) and select third-party accessories. Best Buy is opening its retail stores in the early morning hours on Black Friday, with times varying by region. Shoppers can visit Best Buy's Black Friday website to find the specific retail hours for their local stores. For additional Black Friday discounts, check out our Black Friday roundup, where we are aggregating published Black Friday deals on Apple products and related Apple accessories. I heard most Best Buy stores are opening at 5pm on Thanksgiving. Honestly, **** all these companies for putting the dollar over their employees families. While I agree with your statement. The employees are aware of having to work holidays at a retail company. Not to mention a lot of them volunteer to work on holidays, especially if they are getting paid double or time and half. But I think the wages should be higher to begin with. This I'll disagree with, and here is why. Generally low paying jobs equate to low skill requirements for the job. These jobs have traditionally been meant to provide an introduction to the work force for the young worker or as part time / second income to supplement a households primary source - it was a win-win for the employee and the employer in that respect. Increasing the pay rate for these jobs means fewer jobs available for new workers and for those needing to supplement their income as employers will not be able to employ as many people. If you think employers can afford it, take a look at the profit margins of any company that employs minimum wage workers. By and large the majority do not have huge margins to be able to absorb a doubling of minimum wage. It's that time of the year again! I know it's sad, but, I wonder how many people are going to get beat up or even killed this year. as long as they remember to give thanks to the natives who 'relinquished' their land to us, who cares about a black eye/stampede or two..? i spent a few minutes trying to make that sentiment into a joke but it kinda fails, ultimately... i hate this quote-unquote holiday. i'll bet 90% of those who take the day off shopping were 'too busy' to vote last week. Buy at target and get your credit card stolen. Buy at Best buy and no option for Apple Pay or CurrentC. Really, no way I am shopping this holiday at either location. Cash instantly solves such issues. Increase min wage =More money in the hands of the people = more people spending money = more revenue for companies. Hey MR, let me know when Best Buy flip flops on Apple Pay (which they will). Until then, there's nothing I want to hear about them. LMAO no, if you knew how past depressions/recessions formed and were solved it would be one of the easiest concepts to grasp, unfortunately for you it still goes over your head.